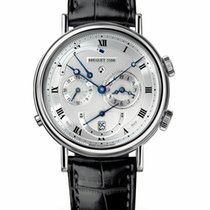 Breguet Classique Alarm, Le Réveil du Tsar 5707bb/12/9v6. 18ct white gold 39mm case. 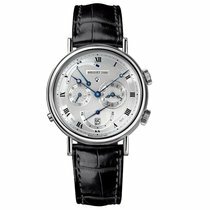 Automatic 519F Calibre, with 45 hours power reserve. Water resistant to 30m. Silvered gold dial with silver outer tracker and Roman numeral hour markers. Blue open-tipped hands. Date at 6 o’clock position, Alarm on/off window displayed beneath the 12 o’clock & is controlled by the button at the 8 o’clock position, Alarm Power Reserve indicator displayed between the 10 & 12 o’clock, Alarm Time indicated by the sub-dial at the 3 o’clock & finally a 24 hours/2nd time zone sub-dial at the 9 o’clock position. Black crock strap with 18ct white gold folding clasp.